We’ve seen a lot of videos of guilty dogs and we just adore the cute guilty faces they make when their human catches them doing something naughty. For us dog lovers, it’s just impossible to get mad at those apologetic guilty faces. Well the dog in the video below not only gives his human the cute guilty face, but he also tries to apologize in the cutest way possible. 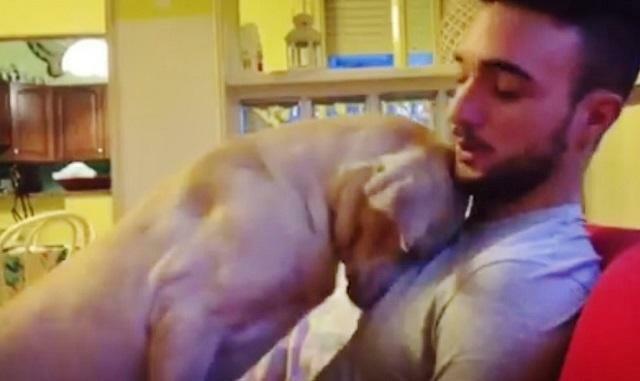 He shows his dad how truly sorry he is by trying to win back his affection. With a sorry face, he confronts his dad; and he even sits on his dad’s lap and tries to hug him! Check out the video below! Awwww… now who could ever resist that sincere, heartfelt, dramatic, and very adorable apology?! I just wanna give that sweet dog a big hug! This post was republished from hot6today.com. You can find the original post here.